AT least 25 cars and trucks have plunged 30 metres from a viaduct in Central China. The fall occurred after a truck carrying fireworks exploded on an expressway, reports say. The explosion in the Sanmenxia area of Henan province on Friday destroyed an 80-metre section of the bridge and shook homes 500 metres away, the semi-official China News Service said. Rescuers were continuing to search the rubble and the number of dead and missing remained unclear. The agency said at least nine died and 11 were injured, while earlier reports by state broadcaster China Central Television and other media said at least 26 people died. 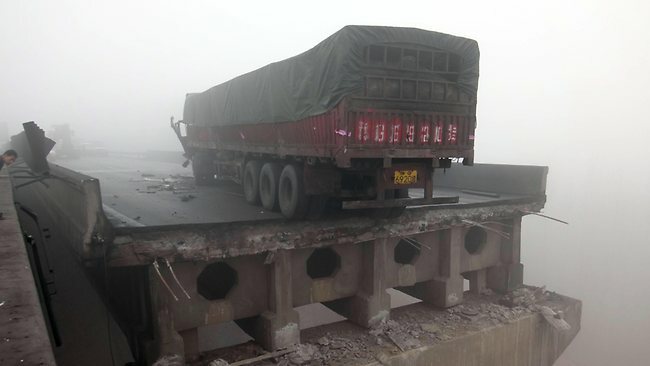 Photographs of the site showed several heavy trucks upside down and crushed among rubble from the concrete and steel bridge in Henan’s Mianchi county. China News Service said at least 10 cars were crushed and buried in rubble, in addition to the trucks. One photograph on the agency’s website, www.chinanews.com, showed at least six cars, several of them apparently burnt out, piled next to two upturned trucks. The initial blast felt “like an earthquake,” it quoted Li Mengliang, who had been eating with his family 500 metres away in Yichang village, as saying. The explosion shattered windows in Yichang, the agency said. “We were driving over the bridge and there was heavy fog at that time,” China Central Television quoted Wang Zilai, a car passenger, as saying. “I was sleeping and then heard a big bang,” Wang said. “Then I saw shredded paper everywhere from exploded fireworks and firecrackers,” he said. “I also saw another car had exploded. I saw more than 10 cars had fallen from the bridge,” Wang said. “It was like a scrapyard,” he said of the scene under the bridge. The broadcaster said about 200 people had joined the rescue work. The official Xinhua news agency quoted officials as saying the rescuers had excavated nine vehicles by Friday evening. Four of the injured people were in serious condition, it said. The truck carrying fireworks was licensed in nearby Hubei province, the reports said. Many trucks are transporting fireworks across China this week ahead of the Chinese lunar new year which begins on February 10. This entry was posted on 星期六, 02月 2nd, 2013 at 1:26 am	and is filed under Uncategorized. You can follow any responses to this entry through the RSS 2.0 feed. You can leave a response, or trackback from your own site.